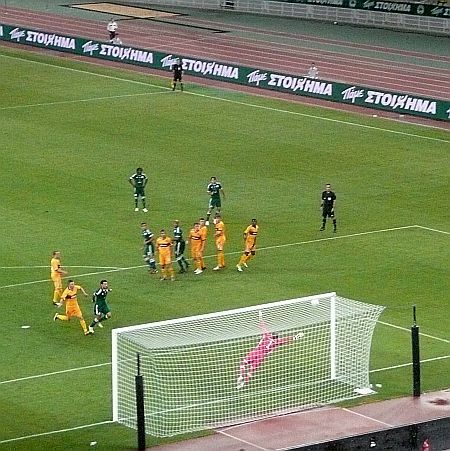 Motherwell's Champion League campaign came to its inevitable end with a 3-0 loss in Athens. We held our own in the first half but Panathinaikos found the net three times in the second to send us into the Europa League draw on Friday. It seemed that McCall’s plan was ticking along smoothly until the break. Young Cummins slotted into the back line to give us a five at the back set up that allowed Hateley and Hammell licence to move forward when the chance arose. Higdon started on the bench and Ojamaa was given the thankless task up front. Both teams were comfortable in the passing game but it was the home side that controlled the early spell. A full ten minutes passed before our first attack and that ended with Murphy firing into the six yard box only to see Boumsong concede a corner. Murphy followed that up by collecting the ball from Randolph and charging up the left wing. His cross failed to find Ojamma in the centre. Randolph had to deal with a few crosses but between punching and catching he looked comfortable in pink. Lasley produced what was to become our only meaningful shot on target on the half hour. His 20 yard blast was headed for the postage stamp corner but Karnezis was up to the job and palmed the ball to safety. That action took place in front of the 600 Motherwell fans penned high in the upper level of the impressive Olympic Stadium. They delivered constant encouragement to the players and delivered every tune in the ‘Well songbook with gusto. Unfortunately that end of the pitch was to see three goals in the second half. The first pair were almost replicas of the two conceded at Fir Park. First, a Hutchinson tackle was harshly penalised and Christodoulopoulos pinged the dead ball into the net from 23 yards. Next, a breakaway, despite the efforts of Cummins who would be booked for his trouble, ended with Mavrias waltzing through our defence to slot home. The tie was long gone when Sissoku eluded Hammell before scoring the third goal. He did his reputation no good with his elaborate celebration that taunted the travelling fans. The biggest cheer came during the enforced quarantine period after the game….”Let’s pretend that we just scored” was the chant that started it off. At least we were able to smile through the defeat. Let’s see what Friday’s draw gives us.